…Seems to be the theme of the day. I did a good job catching up on my Google Reader subscription list last evening. 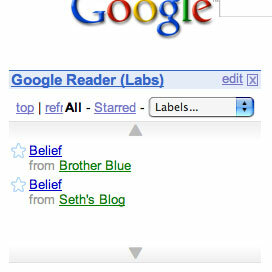 Then when I opened my Google home page this morning, the only two new entries were both entitled “Belief”. At first, I was really scared. I thought someone was trying to tell me something – someone was challenging my faith. Then, I realized that Gene reads the same blogs (Seth’s for instance) that I do. People don’t believe what you tell them. They always believe what they tell themselves. Where does faith fit into this? At what point does the ‘faith of our fathers’ become what our hearts start telling us? How does evangelizing differ from marketing? I haven’t talked much about my career. I’ve got a pretty good theory as to why this is. When I was in software, piddling unfulfilled in a cubicle all day, I had plenty to complain about. Now I don’t have time to complain because I’m busy doing the work that I absolutely love. What do I do? I’m a youth minister. I’m entrusted with entertaining, enlightening, and listening to high-school aged teenagers. A large part of my work play is marketing (which I really love in the small-scale sense that I do it). An even bigger chunk is learning (learning about stuff I love – theology, history, and the ministry of Christ). And the most fun I get to have is the time I get to mentor, teach, speak, sing, hang out, and talk with the young people. There’s so much they can teach me about life and how I don’t have to get old. I’ve just recently decided that I’m being strongly called to being a guest speaker/musician/singer/storyteller (I’ve got to get a shorter name for it – comment if you’ve got something). The idea is that I’ll come share my stories, insights, and music with participants at youth rallies, retreats, conferences, etc.. This sort of thing really excites me. I’ve been in youth ministry (in some form) for the past 6 years (I’m 27), and I’ve been playing liturgical music for the past 15 years. I’ve taught executive training courses, middle school, and elementary school. The trouble is, I don’t really know how to get started. The first gig is always the toughest to get “well where have you done this before?” One lucky part is that I have a captive audience of teenagers that are very supportive of me. Teenagers are honest. They also have very little tolerance for mediocrity.